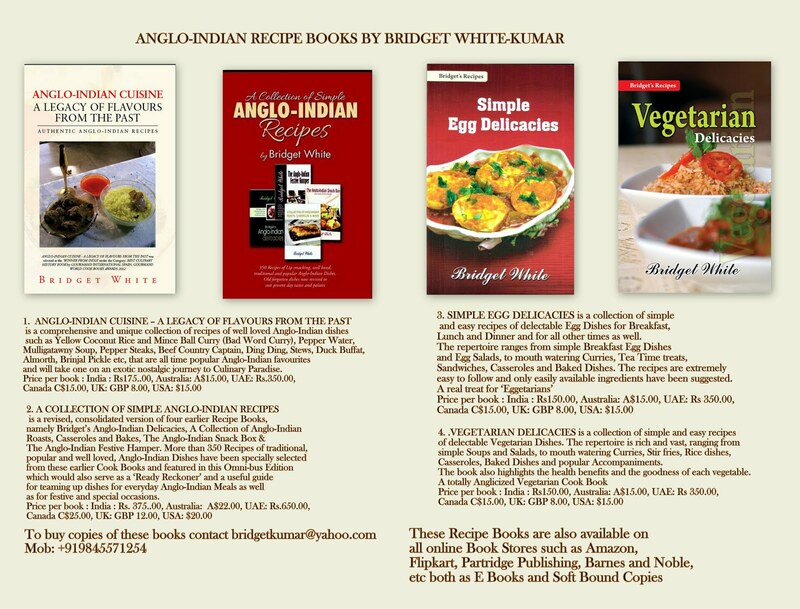 Simple Anglo-Indian Recipes by Bridget White-Kumar. 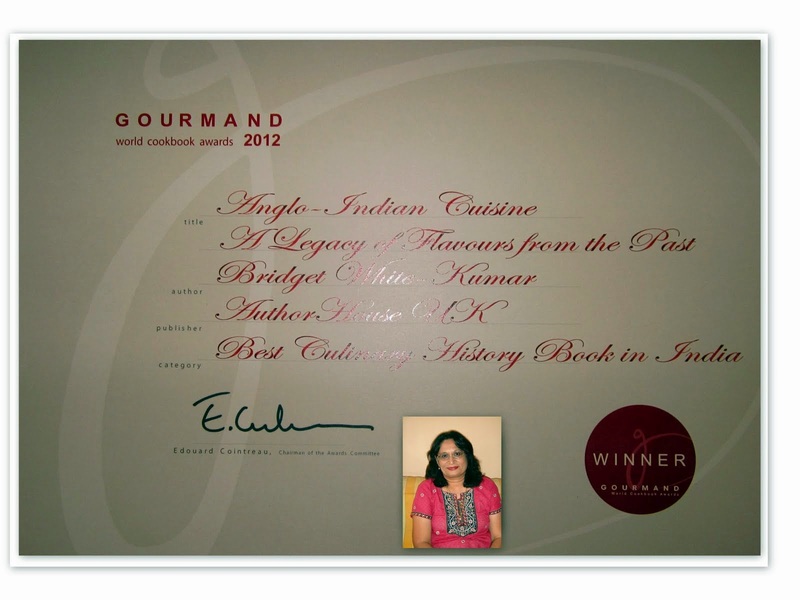 Authentic Recipes of Colonial Anglo-Indian Cuisine - Lip smacking recipes of popular and traditional Anglo-Indian Food. Old forgotten dishes now revived to suit present day tastes and palates. KALKALS or KULKULS are prepared all over India at Christmas time. 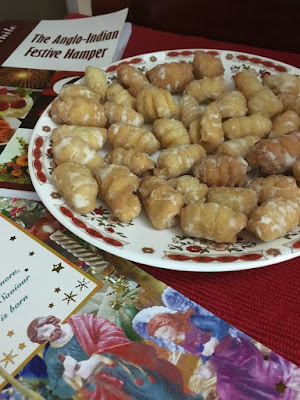 A variant of ‘Filhoses Enroladas’ a Portuguese Christmas Sweet, Kalkals, (always referred to in the plural) are crunchy inch-long curled or shell shaped sweetened fried dough Sweets. Sugar and flour are combined with eggs, milk and butter to a soft dough and then small marble sized balls of this dough are rolled on the tines of a fork or a comb to form a shell or a scroll, then deep fried in hot oil. The dough is sometimes rolled out and cut into different shapes such as hearts, spades, diamonds etc with cutters or a knife and then deep fried in hot oil. The Kalkals / Kulkuls are later frosted or coated in hot melted sugar syrup. Since the preparation of Kalkals is a time consuming process and requires many hands to help in its preparation, a separate day is designated as ‘Kalkal Day’ a few days before Christmas, when every member of the family spends a few hours rolling out his/her portion of the kalkal dough. While one doesn’t know how the name ‘Kalkals / Kulkuls’ got its nomenclature it is probably because of the “curls” of this particular Christmas Sweet. Mix the flour, salt, sugar and baking powder together. Add the coconut milk and eggs and knead to a soft dough. Keep aside for an hour. Form the kalkals by taking small lumps of the dough and roll on the back of a fork or a wooden kalkal mould, to form a scroll. Alternately, roll out the dough and cut into fancy shapes with kalkal or cookie cutters. Heat oil in a deep pan and fry as many kalkals as possible at a time. Keep aside. To frost the kalkals, melt 1 cup of sugar with ½ cup of water and when the sugar syrup crystallizes pour over the kalkals and mix well. Store in air-tight boxes when cold. Spicy Tripe or Boty Curry was a very popular dish with the Anglo-Indian community. In the olden days it was prepared with freshly roasted and pounded ingredients. The Boty or the tripe would be washed well and cut into long thin strips then cooked in sufficient water for hours till tender over a firewood oven. Now with a pressure cooker the same dish can be prepared in just 45 minutes. It was served with bread or rice and sometimes as an accompaniment with drinks. Tripe tastes delicious with coconut rice. Wash the tripe well turning it inside and out. Cook it in sufficient water with the channa dhal (cudla dhal) / Bengal gram dhal and a little salt in a pressure cooker till soft. Drain and keep the soup aside. Heat the oil in a pan and sauté the onions, ginger and garlic lightly. Add the sliced cooked tripe tripe, salt, turmeric powder, chillie powder, cumin powder, coriander powder and pepper powder and mix well. Cover and simmer on low heat till the gravy thickens. Add the boiled potatoes and mix once so that the gravy covers the potatoes. Anglo-Indian Community can be trace back to as early as the 16 th century i.e. to the advent of the Europeans into India . The Portuguese, Dutch, Spanish, French etc. came to India to trade in spices. Towards the later half of the 18 th century, the British made their presence felt with the establishment of the East India Company. As a result of the inter-mingling and inter-marrying of thevarious European races, a new multi-culturaland multi-racial community evolved over many centuries, which later came to be known as the Anglo-Indian Community. The Anglo-Indians are a unique race of people, who, by combining both European and Indian Cultures have evolved a distinctive culture of their own. They have their own special taste in food, which is a direct reflection of their multi-racial and hybrid heritage. In Anglo-Indian Cuisine the spicy “ Indian Curry” is given as much importance as the bland “ English Roasts”. Anglo-Indian Cuisine has taken the best of both European and Indian Cuisine and altered it by adding or substituting some of the ingredients so that a completely different cuisine was evolved over hundreds of years. The very popular Vindaloo, Beveca and Dodol are legacies of the Portugese, while the Roasts, Bakes, Bacon and Eggs are typically British. 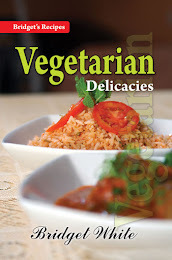 Many of the dishes have rhyming alliterative names like Dodol, kalkal, Ding- Ding, Pish-Pash etc. The very nomenclature of the dishes is unique and original, and synonymous only to the Anglo-Indian Community. The normally bland western cuisine was given a dash of exotic Indian Flavour. Thus a completely new contemporary cuisine came into existence making it truly “Anglo” and “Indian” in nature, which was neither too bland nor too spicy, but with a distinctive flavour of its own. It became a direct reflection of the multi-cultural and hybrid heritage of the new colonial population. The Word “GASTRONOMY” means “THE ART OF GOOD EATING” and this is very true of Anglo-Indian cuisine, which is an ART IN ITSELF. 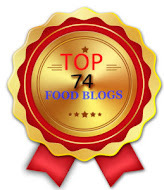 ALL CONTENT ON THIS BLOG IS THE SOLE COPY RIGHT OF BRIDGET WHITE-KUMAR. 1. 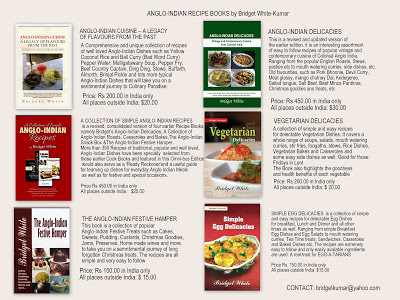 ANGLO-INDIAN CUISINE – A LEGACY OF FLAVOURS FROM THE PAST is a comprehensive and unique collection of easy-to-follow Recipes of popular and well loved Anglo-Indian dishes. The repertoire is rich and vast, ranging from Roasts, Cutlets, Croquettes, Pasties, etc, to mouth watering Curries, Side Dishes, Spicy Fries, Foogaths, Biryani and Pilafs, Pickles, Chutneys etc, picking up plenty of hybrids along the way. The sumptuous Anglo-Indian dishes such as Yellow Coconut Rice and Mince Ball (Kofta) Curry, Pepper Water, Mulligatawny Soup, Grandma’s Country Captain Chicken, Railway Mutton Curry, Dak Bungalow Curry, Crumbed Lamb Chops, Ding Ding, Stews, Duck Buffat, Almorth, etc, which were very popular in the olden days will take one on an exotic nostalgic journey to Culinary Paradise. SIMPLE EGG DELICACIES’ is a collection of simple and easy recipes of delectable Egg Dishes for Breakfast, Lunch and Dinner and for all other times as well. The selection covers a wide selection of Breakfast Egg Dishes, Mouth watering Curries, Egg Salads, Tasty Tea Time Snacks and Treats, Sandwiches, Casseroles and Baked Dishes. In addition to the recipes, ‘Some handy hints on how to store and preserve Eggs’, ‘A few Quick Serving ideas using Eggs’, besides some useful tips and tricks on how to prepare a variety of fluffy and soft Omelettes and the names and description of the various Egg Dishes are also given. I decided to bring out a Recipe Book on exclusive Egg Recipes since I found that many people who are vegetarians do include Eggs in their diet. This Book ‘SIMPLE EGG DELICACIES’ is a real treasure for ‘Eggetarians’ as there are recipes for a variety of egg dishes under different categories. The recipes are mostly Anglo-Indian but I've also included some tasty Indian Egg curries and some universal all time favourites such as Eggs Benedict, Egg Florentine, One Eyed Jack, Coddled Eggs, Shirred Eggs, Egg Frittata, Egg Quiche, Egg Custard, Eggs Mornay, Egg and Sausage Casserole, Scotch Eggs, Devilled Eggs, the Classic Egg Salad, French Toast Casserole, etc. The recipes are very easy to follow and only easily available ingredients are made use of.